As the Catholic Chaplain at San Quentin, I have religious services for the men on death row on Wednesdays. That day I was eager to hear their reactions. I wondered what the mood on “the row” would be. Over the eight years I’ve worked at San Quentin, I have had many conversations with men on death row. It is always strange to discuss executions with them. It is uncomfortable in the way that talking about cancer with a terminally ill friend or family member sometimes can be. 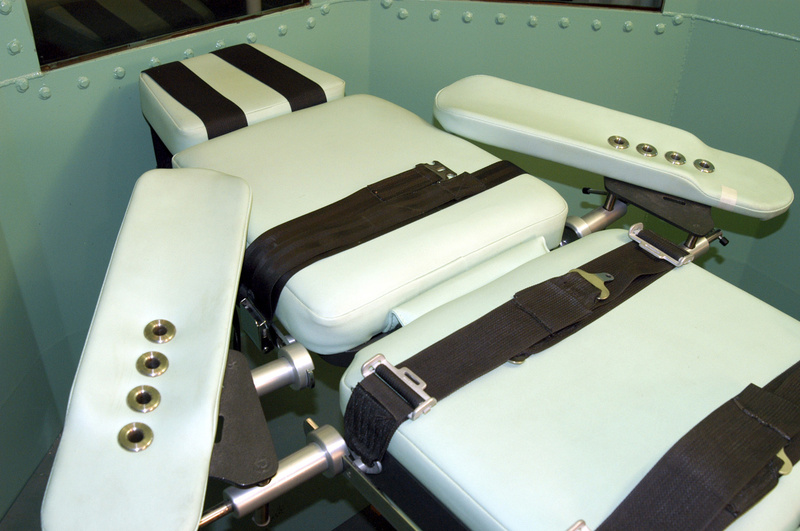 Everything about the death penalty system seemed to be designed to deny hope. Most of the men have shared with me how they experience every day the searing recognition that society has deemed them no longer worthy to live. They have lived with this condemnation hanging over them like a curse for years, sometimes for decades. The mood in “East Block”—where most of the death row inmates are housed—is usually somber. The building is dark and the shadows deep. Many more inmates have died from suicide than from executions since the death penalty was reinstated in the 1970s. Despair pervades the East Block, and I always feel the spiritual oppressiveness of the place. When you walk up to the entrance to death row, the first thing you see are the large letters on the black metal doors that read “CONDEMNED.” Everything about the death penalty system seemed to be designed to deny hope. On Wednesday morning, then, I was surprised at first by how subdued their reactions seemed. I think they were initially trying to process the news. After years of uncertainty and resignation, they were grappling with a very unfamiliar feeling in the death house—hope. These are men who life has not treated very well to begin with. My impression was that they didn’t want to “jinx” the good news by getting too enthused about it. We are only at the beginning of our mission to correct the injustices in our criminal justice system. Nonetheless, everyone I spoke with was grateful for the reprieve. One man, sitting in a small, gray, padlocked holding cell, said that he thought the governor’s action was courageous and that it was a positive first step toward abolishing the death penalty. I have never had the impression that the men on death row feared executions. What they (and most prisoners) fear the most is dying sick and old, all alone in a dark cell, forgotten by all who mattered to them. This is why I believe life without the possibility of parole is even crueler than the death penalty. Still, we have a long way to go as a church; future generations will question why we Catholics have not done more to address the sin of mass incarceration. We are only at the beginning of our mission to correct the injustices in our criminal justice system. It is inspiring that Gov. Newsom framed his opposition to the death penalty in moral terms, citing his own Catholic faith and his education by Jesuits in informing his decision. Not only did Gov. Newsom give the inmates on death row a reprieve, he gave all of us a brief reprieve from so much darkness in the world, in our political culture and in the church. In a word, he gave us hope. This is a wonderful statement of genuine Christianity at its most Gospel best. From a perspective of past work in a maximum-security prison with the likes of convicted murderers, I can affirm what a moving experience it is to get to know such people, to hear their stories and get a sense of their pre-crime life trajectory, and, in most instances, to experience their very genuine and gut-wrenching remorse for the suffering they caused their victims, the victims’ families, and themselves and their own families. In some prisoners, that remorse takes a long time to develop. In some hardened people, it never grows. I had no trouble getting horrified at some of the crimes that were committed. But onsite daily, one gets to know the whole human beings who have become so much more than the crimes they committed. One can watch a prisoner gain a genuine spiritual side and grow immensely as a person, even within the confines of those successive steel gates that lock you inside for your working hours. I am glad the California governor saw the futility of capital punishment, of destroying lives which have accrued meaning, and of always actualizing the proven statistical risk of executing an innocent person, a truly scary and morally unjustifiable hazard. A true testament to the value of all human life. Thank you, Fr. Williams. Compassion cannot be taught but it may be learned through testimony like yours. I am so glad that your flock on death row know that we care about them, that their lives have meaning. George Williams, S.J., is Catholic chaplain at San Quentin State Prison in California. He has a doctorate in criminology from Northeastern University.